Toddy shops are serving chicken curry as a side dish for toddy.So it should be hot.I got this recipe several years back from a toddy shop but never tried this before.My hubby cant tolerate that much spicy curry. 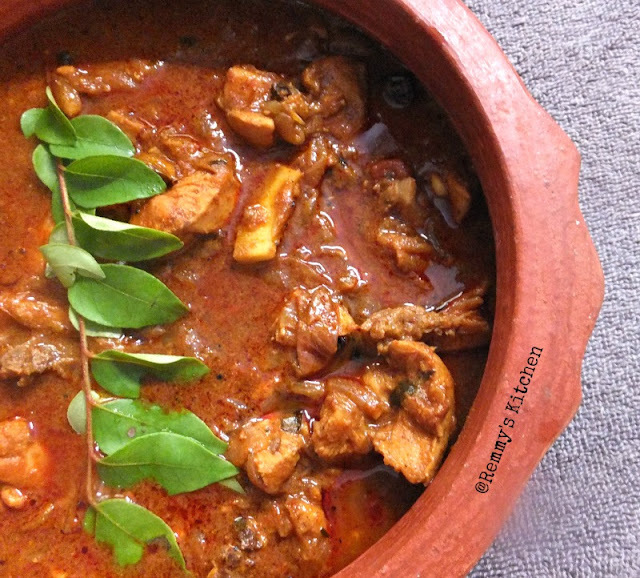 When my best friend and family visited us here, I took this recipe and made a try.I served it with boiled tapioca and rice!Coconut bits with chicken pieces will give a feast to your taste buds!!!!!!! 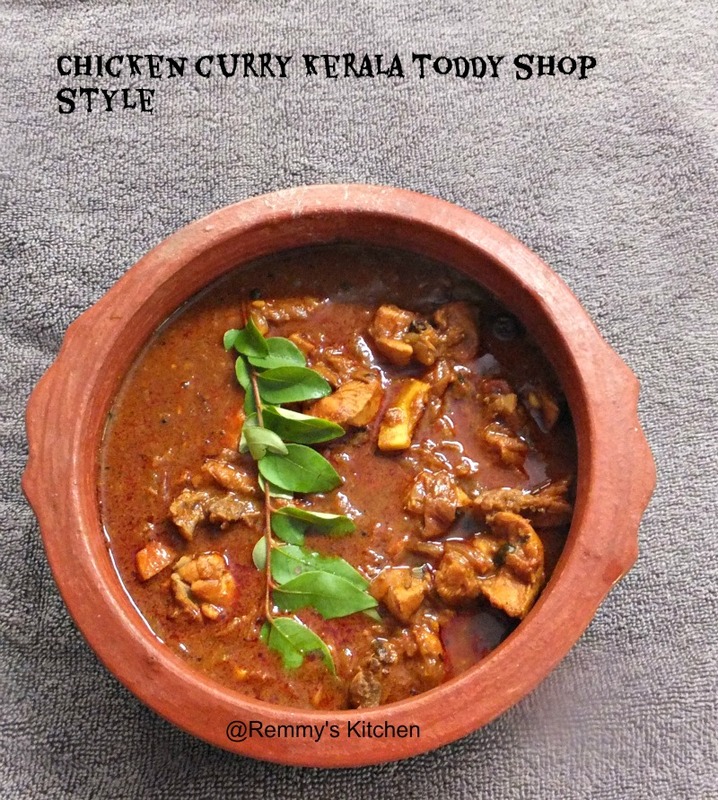 If you love spicy chicken curry if you are searching for such a recipe your search ends here.....A super tasty side dish for non veg lovers! Wash and clean the chicken pieces.Marinate with curd and salt.Keep aside. 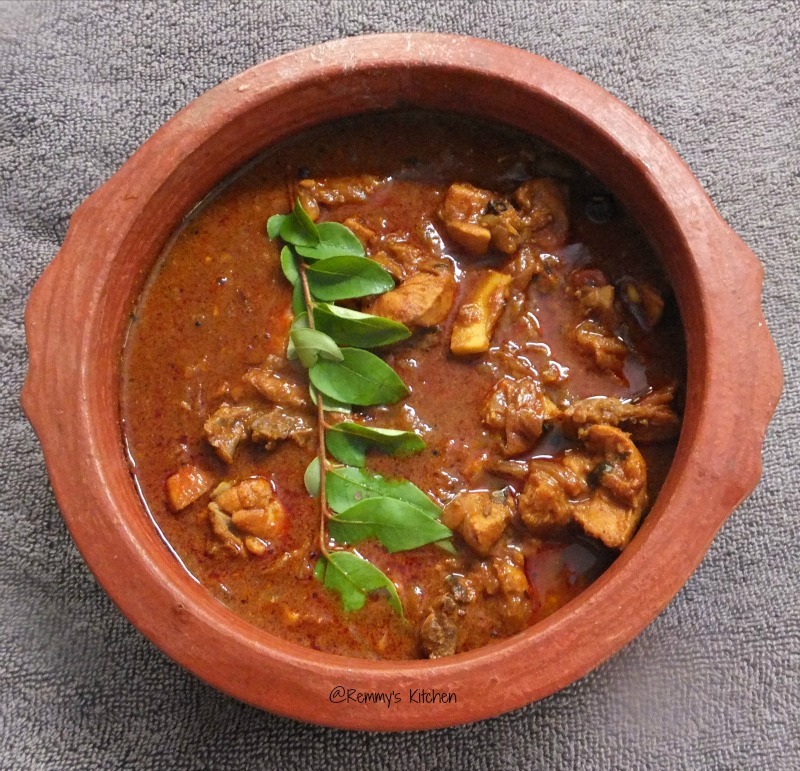 Heat a clay pot / iron skillet / uruli ( ) with oil.Add mustard ,fennel , dry red chilly,curry leaves,cinnamon cardamom clove pepper and coconut bits. Add in coriander powder,chilly powder turmeric powder and garam masala powder. Add marinated chicken pieces.Now add salt.Mix it well. Keep the clay pot closed for few minutes in low flame. Add enough water and cook it in low flame. Wow....drooling over this chicken curry......! Divine and loved. Toddy?? Oh yes, good one and had something similar in Kerala. First the "Toddy Style" and second the serving with "boiled tapioca"... I am going all drools here. Super luking curry.. love the pot n presentation.